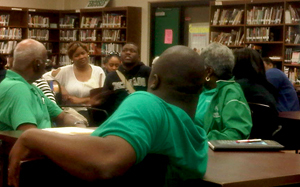 The state’s plan to transform Walter L. Cohen High School into a charter school over the next two years inspires a mixed reaction through the school community, based on a Wednesday night meeting with dozens of alumni, faculty, parents and students. While some Cohen supporters agreed with the state that the school is in dire need of dramatic change to its dismal, lowest-in-the-state performance, many remain skeptical about what they see as a painful transition with an uncertain outcome. The plan at Cohen is for a gradual takeover by a charter operator, New Orleans College Prep. This year, the direct-run Cohen did not accept any ninth-grade students, while College Prep began operating a ninth grade on the third floor of the Cohen building. Next year, the traditionally-run high school will only have 11th and 12th grades, while College Prep will add a 10th grade. 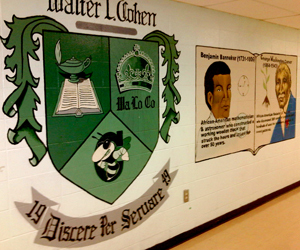 Based on an agreement with the Walter L. Cohen Alumni Association, the school will retain its name, modified in some cases as “Walter L. Cohen High School (operated by New Orleans College Prep).” In return, the Cohen alumni have agreed to remain involved in the new school through academic mentoring and social work for students. “I graduated from Cohen in 1992, and when I looked in the paper [this year] and saw that Cohen had a F+ and a 28-point performance score, I was pissed off, and everyone in this room should be too,” Murray said. Decades ago, Cohen was a school with a reputation for excellence, one that children from around the city would cross district lines to attend, Murray said. Over the years, it seems to have become progressively harder for the students who want to excel to do so, which is why the alumni support the transition to a charter operator. “The only way to modify that situation is to change the climate and culture around the students,” Murray said. Cohen’s assistant principal, Susan Moore, said not enough attention has been focused on the recent growth in Cohen’s scores. Cohen’s “F+” is comprised of two pieces: the “F” is based on the low score itself, but the “plus” represents the school’s growth over the last year. Cohen’s performance score jumped nearly eight points from 2009 to 2010, from 20.4 to 28.2, and inched upward again in 2011 to 28.8. In fact, New Orleans College Prep is one of the city’s school that has a “minus.” It made a similar jump to Cohen’s two years ago, from 67.1 to 73.4, but slid back in 2011 to a 67.6. Many of the city’s most troubled students end up at Cohen, White acknowledged, saying that if some growth wasn’t being demonstrated, the school’s transition to a charter would be much more sudden. Beyond the scores, 1980 Cohen graduate Larry Jackson said he is skeptical about the overall plan for the city. He said it seems designed to continue pushing low-performing students away, “eliminating” them from the program rather than educating them. Every morning when he’s jogging, Jackson said he sees children being picked up by school buses at 5:15 or 5:30 a.m. that won’t arrive at school for nearly three hours. “They’re working longer hours than I am,” Jackson said of the students. White agreed, saying he recently visited a school that served students not only breakfast and lunch, but also dinner. The Recovery School District is working on a citywide application process this year that will give preference to students who want to attend schools closer to home, cutting down on transportation times, he said. “The obligation is not to displace them. It is to find a place that will work for them,” White said. The process of transition at Cohen also came under fire, with extensive questioning about how much job security high-performing teachers at Cohen actually have. White said they will receive preference but not a guarantee of employement, and College Prep director Ben Kleban said he would be “crazy” not to hire strong teachers from Cohen. Students and parents also questioned the experience for students, saying that the separation of the two schools inside one building is creating tensions and a negative experience for students. In one particularly emotionally-charged moment, a woman declared that “There’s going to be a war in here” before storming out of the room. While acknowledging the difficulty of the change, White said the stakes are too high not to proceed. The meeting ended promptly after an hour, but White stayed in the Cohen library to talk for another forty minutes, seated at a table surrounded by current Cohen students, with their parents and older siblings standing behind them. Tevin Quinn, a Cohen junior, said he’ll remain at the school so he can stay in the marching band and on the basketball team his senior year. But seeing the campus slowly taken over by a separate school is both unpleasant and unfair, he said. First off his this character Murray? Secondly, when does an Alumni group become the experts in education and are relied on so heavily in the decision making process of what is best for schools? Thirdly, Mr. Murray, who graduated in 1992, my gut feeling is that if your Class of 92 took the test that these students are taking your class of 92 would have scored very low. We have to stop grading our schools on this state testing. There is way more to schools then test scores. People wonder why the crime is so high. Maybe because we are teaching our young people how to take test instead of how to be viable citizens, social skills, and all the other things that are involved making an individual a well rounded person. Schools are not fortune 500 companies, and we need to keep that in mind when we talk about education. Schools were not setup to make a profit or show growth. We have to undertand that when you are using these test as gauges please keep in mind that the test are unfair and bais. It is this way so that schools can fail and be given to these private businesses who have no moral obligation to these kids or this city other then getting them to pass this stupid test. Do people understand that when you place a school under the scrutiny of having to pass a test for survival, do you realize all the unethical things that will come about? It’s remarkable that out of all the people who was quoted in this article, including John White, the only one who made sense was the assistant principal from Cohen. I wonder why…Oh, maybe it’s because she was the only one who truly has experience in education. The sad thing about being in the education industry is that we are the only industry that does regulate itself. By that I mean…The people who make major decisions have no background in education. Can you imagine the state medical boards not having doctors on it but instead politicians. Nathaniel lang the enforser he put his foot down and did the inposibile. Proper action was taken . But this is my byas opinion . And its non accepted by any collage . .just punishment schools for the unfortunate.